The ninth issue of the HEPHAISTOS yearbook, presents the work of eight internationally outstanding metal artists: - Albert Paley (the USA) - Terrence Clark (GB) - Michael Haase (D) - Lothar Klute (D) - Lars Larsson (s) - January Odvarka (CZ) - Brad Silberberg (the USA) - Torsten Theel (D). Albert Paley ranks among the most well-known and most important metal artists at present. Particularly because of its sculptures and gates he creates. Many English-language books concerning Paley are nearly completely out of print. Our yearbook concentrates therefore particularly on recent work of Paleys and his metal organization within the applied range. An American metal artist in completely different color is Brad Silberberg, one of the prominent smiths of the United States. For over 25 years he has worked with metal and just a few years ago predominantly architectural forging work and furniture manufacturing. Today he devotes time in the workshop to objects, sculptures of art-relating to crafts, decoration and mobiles, which he uses as "transformation tools". From handling metal Silberberg arrived out at a completely new viewpoint of material and environment, of creation and the like. Contrasts, which develop tensions, mark the work of the Swedish metal artist Lars Larsson. Candle stands and everyday motives, sucha ase bowls. He has his work in over 20 churches in Sweden, in addition to other buildings. Numerous elements in banks and public buildings carry the handwriting of Larsson. Smith and formative philosopher, who carries his convictions with his internal glow coming outward, is the Britisher Terrence Clark. The "English school" is to be regarded to its work, He mixes with approaches of British humor. Their is so much more on all the artists! 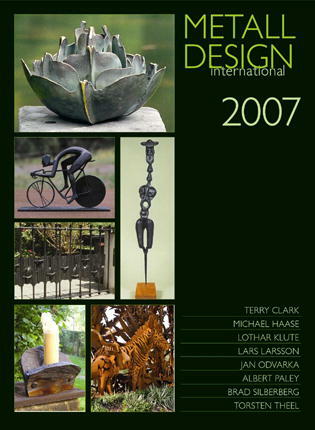 Architects will want to use Metal Design 2007 for wonderful ideas.